While on a quest to find his father, Thorn is caught by slavers and sold to the executioner of Gehenna – a land where darkness and death are highly revered. There, he meets Lilith Shadow, the ruler of Gehenna, who, through ill-wrought diplomacy to end a war, is being forced to marry a disgusting, sniveling, bully of a prince. Meanwhile, an evil necromancer is haunting Gehenna, threatening everything Lilith holds dear. Shadow Magic is a magical fantasy adventure from a debut author, Joshua Khan. Meant for 4th – 6th graders, I’d put Khan’s writing on par with Brandon Mull and Jonathan Stroud’s earlier series – as with Mull’s and Stroud’s earlier writing, there’s room for improvement to become an amazing rather than “just” a great middle-grade fantasy author. I was highly impressed. I can tell already that Khan will be another favorite author. 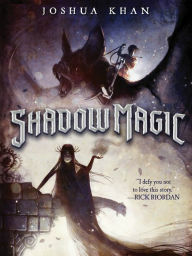 I loved the world-building, characters, and plot of Shadow Magic – all were creative and fun. Bonus points for being able to wrap up all the loose threads so that there’s room for a second book, but no need or expectation for one. Khan is working on the second one now, and I am eagerly awaiting it to see how the characters grow.